To mark New Jersey’s 350th anniversary, the New Jersey Chamber of Commerce is polling state residents about what they believe has been the state’s greatest achievement. Among the choices: such things as the invention of the light bulb and the phonograph, new antibiotics, solar panels, condensed soup and salt water taffy. But if the Democratic leaders in the state legislature continue to hold firm in their opposition to Governor Chris Christie’s raid of the state pension fund to balance New Jersey’s budget then the state’s greatest accomplishment may turn out to be the Democrats determination to protect a decent set of benefits for the middle class. And if they do continue to fight against Christie’s wrecking-ball attack on the benefits of state workers, it would cripple Christie’s argument that he should be the 2016 GOP standard-bearer because he knows how to work across the aisle to enact harsh budget cuts. Also a matter of fairness is that this plan will make the full pension contribution that the governor promised. We must keep that promise. Staying true to the promised payments is also a matter of financial integrity. Abandoning the promise will cost more in higher interest rates and lower credit ratings. This plan is not only a matter of fairness and responsibility with pension payments, it is really about the full range of government services and opportunities, including such things as property tax relief, college affordability, public schools, law enforcement, transportation and many more priority needs. We have to maintain the state’s commitment to all New Jersey residents by meeting all of our commitments. It was Sweeney, a protégé of political boss George Norcross, the businessman power broker who controls Democratic politics in South Jersey, who was instrumental in initially helping Christie ram a harsh state employee pension deal through the legislature in 2011, cutting benefits, increasing employee payments and raising the retirement age. In exchange for this, state funding for the pension fund was to be dramatically increased to improve its long-term solvency. But in May Christie ripped up the agreement when tax revenues fell short of estimates, forcing him to come up with money to balance the budget this year. Now Sweeney wants to run for governor when Christie leaves and he knows he can’t do that without union and state employee backing. As Christie Watch has reported, about a dozen unions, including the New Jersey Education Association and the Communications Workers of America, along with those representing police, firefighters and other public sector workers, filed suit to stop Christie’s pension scheme. 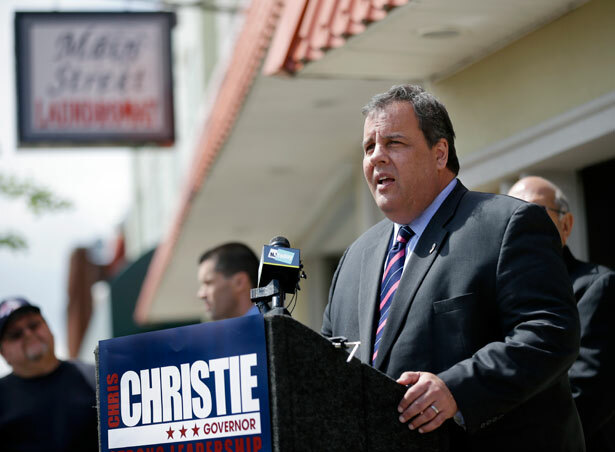 A larger coalition, including community, environmental and other activist groups, has been demonstrating and lobbying against Christie’s actions. The Sweeney-Weinberg plan was applauded by these unions, who have called for similar tax increases. Charles Wowkanech, president of the New Jersey State AFL-CIO, said, “the only winners in Chris Christie’s economy are millionaires and Wall Street CEOs. The Senate President is presenting a plan that puts the middle class first, and forces the wealthy that have benefited so much under this governor to pay their fair share,” Wowkanech said. “The governor has been emphatic that he will not raise taxes on already overburdened New Jersey taxpayers suffering from one of the harshest tax structures of any state in the country,” said a Christie spokesman, Kevin Roberts, responding to Sweeney’s announcement today. A state judge will hear the union lawsuit on June 25. Yesterday the board of the largest state pension plan, the Public Employees’ Retirement System, representing over 400,000 active and retired workers, also voted to sue the governor on the pension issue. More than 10,000 public workers had sent letters to the pension board urging it to take action. The head of the board, Thomas Bruno, a retiree and former official of the Communications Workers of America, said the board had a fiduciary duty to demand the pension payment. But three board members, representing Christie and the state treasurer, recused themselves. Yesterday too the state attorney general filed a court brief in answer to the union lawsuits. It argued that while the 2011 pension reform legislation provided a contractual right to the pension payments, the contract is with the legislature, not the executive branch. And, Christie’s lawyers argued, the decision to stop the pension payment is justified because the state budget crisis is unprecedented and the governor has a legal charge to balance the budget. Sweeney’s tax plan could speed through the Senate next week, in time for the court hearing on the lawsuit against Christie’s plan June 25. But even if it passes the Assembly in time to be a key part of the budget for next fiscal year, Christie is likely to veto it, as he has done several times with the “millionaires tax.” But legislative leaders are talking about placing it before voters as a ballot initiative. It may not be possible because of legal technicalities to have the measure go to voters until 2015. Which is the same year that Christie, if he decides to run for president, will go before the nation’s Republican primary voters.